Hi Rubies, it's that time already - free printable day!! 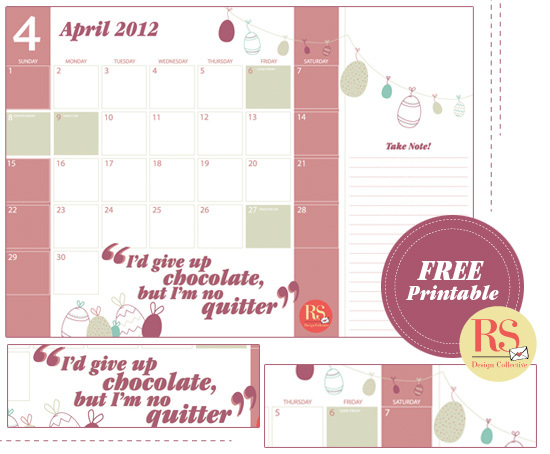 And this month we have a lovely April calendar filled to the brim with Easter eggs (and public holidays!) - just like our tummies are going to be this weekend! Download a copy for yourself here. We hope you have a very well rested long weekend and that you take time to relax in your own way! 01 April seems to be the month of comedy and Barry Hilton kicks it off with his show at the iZulu Theatre in Sibaya Casino. Tickets are R140 per person. 02 Comic genius Russel Peters will be hitting South Africa with his sold-out "Notorious World Tour" show. Tickets are R288 - R669 per person and the show takes place at the Durban International Convention Centre. Tickets available here. 05 - 09 The ever popular Splashy Fen Music Festival returns to KZN during Easter weekend. Acts include The City Bowl Mizers, Van Coke Kartel, Arno Carstens, Lark, Zebra & Giraffe, The Black Hotels, December Streets and Shadowclub. Advance tickets are available at Computicket for R500. Don't forget to pack your gumboots and some warm clothing...brrr! 07 Our favourite market, the I Heart Market, takes place on the first Saturday of the month at the Moses Mabhida Stadium. 11 - 12 The East Coast Comedy Festival looks to be a lot of fun with SA's top comedians all taking the ICC stage. The event starts at 8pm and tickets range from R140 - R250 per person . 21 The Litchi Orchard Market is great if you are a food and art lover alike. This market happens every first and third Saturday of the month from 9am to 1pm in Seaforth Road, Umhlali. 27 - 29 Champagne lovers, this one's for you! The KZN Bubbly Festival takes place over two days at the Makaranga Lodge in Kloof and the Piggly Wiggly in Howick. Tickets are R180 per person and include a free glass of bubbly and 10 tasting tickets. Bottom's up! 28 - 29 The Durban Youth Fashion week showcases some of Durban's young fashion designers from leading fashion institutes. They will feature their Autumn / Winter 2012 ready-to wear collections.